He says he has been misquoted by some motivated media to propagate the BJP propaganda. Your comments on Sardar Patel and Kashmir have been used by the BJP to attack you. They say you presented Patel as less than committed to a nationalist India. Let the BJP interpret my statement whatever way it will twist for their propaganda, keeping their eye on 2019 [elections]. 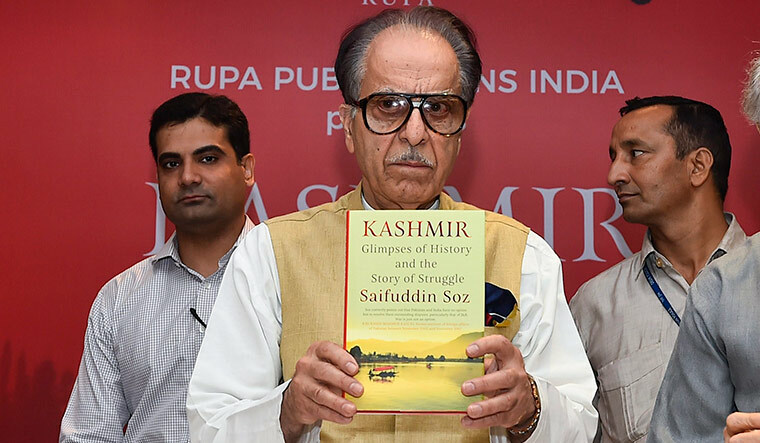 I emphasise to you what position I had taken at the launch of my book [Kashmir: Glimpses of History and the Story of Struggle]. I said that Jawaharlal Nehru and Sardar Patel, two great sons of India, wanted to make India strong in their own way, and Sardar Patel had one condition in his mind that he wanted to avoid a war. He had suggested to Liaquat Ali Khan in the partition council itself that he (Liaquat) should not talk of Hyderabad-Deccan as Hyderabad-Deccan was not connected with Pakistan, in any way. So, avoiding the possibility of war and in the larger interests of neighbourhood, Sardar Patel in good faith, had offered Kashmir to Liaquat Ali Khan in the Partition Council where Lord Mountbatten, Nehru and two civil servants [and other] members of the Partition Council—H.M. Patel and Chaudhry Muhammad Ali—were present. Debates in the Partition Council are available in national libraries and archives. Please also see a long comment on Sardar Patel’s perception in Kuldip Nayar’s book Beyond the Lines; An Autobiography. Please read Pakistan sources as well— Chaudhry Muhammad Ali’s book The Emergence of Pakistan and The Nation That Lost Its Soul by Sirdar Shaukat Hyat Khan. Sardar Patel never wanted to take the Kashmir issue to the United Nations. Also, he oversaw all the internal dialogue over what Article 370 should allow. Do you feel you did not emphasise some of these other details much? You are right. But, there was no occasion to stress it. It is an obvious fact. I respect Sardar Patel equally as I respect Nehru. It was not a situation that I left out any important thing. I spoke there as per my requirement. Your comment that all Kashmiris want azadi seemed irresponsible in the context of the security challenges on the ground. After decades in mainstream politics, what made you say what you did? Where did I say azadi like this? I only said that independence was not possible then and it is not possible today. Since the launch, I have been misquoted by some motivated channels as per their needs of propaganda for BJP. I only mentioned that General Pervez Musharraf had explained to his generals and political class that Kashmiris have no feeling for Pakistan and he had also said that independence was not possible. But, the criticism is also that you echoed Musharraf’s position on Kashmir by saying most [Kashmiris] do not want to merge with Pakistan; they want azadi. Why quote a Pakistani general responsible for the Kargil war and other transgressions? The only thing I emphasised in this connection was that after the defeat in Kargil, Musharraf wanted to promote his so-called peace initiative in an atmosphere of hope that had got generated by [prime minister ] Atal Bihari Vajpayee signing the famous Lahore Declaration on February 21, 1999 with prime minister Nawaz Sharif.... Musharraf only came in the discussion as a side issue to buttress the perception that independence was not possible at all. When the UPA was in power there was virtually no forward movement; no talks with separatists. Even the interlocutors’ report was not tabled in Parliament. Do you believe your own party also failed Kashmir? These questions can be raised with the leadership. But, I can say that the Congress was all the time talking to people of Kashmir, Jammu and Ladakh. There is resurgence in local militancy in the last few years. Even educated boys and school toppers are joining it. What do you attribute this to? Kashmiris were alienated over a long period of time in many ways. The Armed Forces (Special Powers) Act itself is a very great instrument that caused deep alienation. The CBI itself went to the Supreme Court on March 19, 2012 with the proof that the encounter at Pathirbal [March 2000] in which seven innocent people were killed by the Special Operation Group [of the Army] was totally fake. The killings of these innocent people were described by the CBI as cold-blooded murders. Last year that the Supreme Court transferred that case to the Army and everybody knows the fate of the case. Some believe the real challenge today is radicalisation. How do you see the changes in the nature of the problem? My perception and hope is that Kashmir will never [get] radicalised. We can see that there is anger, but there is no radicalisation. It is, therefore, a misreading of people’s mind. Kashmir is actually a political dispute and it will get resolved through a vigorous political dialogue. My idea is that if the Union government (as also the national opposition) opens the dialogue with the people of Kashmir, the parties in the dispute will come to an ‘acceptable mean’. In my opinion, the present Joint Resistance Leadership (JRL) happens to be an instrument through which angry people of Kashmir can be reached. Why did the Congress boycott your book function? P. Chidambaram was supposed to launch it and he stayed away as well. Did your remarks become too much of a political hot potato? I never suggested anything which is beyond the Constitution. The BJP can twist facts to sustain their flawed agenda, keeping eyes on general elections of 2019. As for the Congress leaders not attending release function, you could raise this question with them, rather than with me. On my part, I can say that, the party is always supreme. The supposed four-point formula of Musharraf and Manmohan Singh involved accepting the Line of Control as the de facto international border; but make the border irrelevant. For this, India would have to give up rights on Pak occupied Kashmir. Where do you stand on this? General Musharraf is a side issue. There are so many points and it is non-paper still available with Pakistan and India. I was mainly emphasising the point that Kashmiris were not for Pakistan and independence is also not possible. Do you think Kashmir is headed for a prolonged period of governor’s rule? How do you see the end of the alliance [between the BJP and the PDP] and why hasn’t the assembly been dissolved yet? Are there attempts to split the PDP and form a new government? I don’t know how long the governor’s rule will continue. Since the BJP is reportedly still trying their time-tested method of horse trading, the assembly was kept in suspended animation. On behalf of the state’s premier party, the National Conference, Omar Abdullah has gone on record to seek dissolution of assembly and subsequent elections. Your one prescription for starting to heal things in Kashmir. The solution to the political crisis in Kashmir can be found through a vigorous political dialogue with the Kashmiris and the JRL can be reached as an effective instrument of the dialogue process.